My parents are out attending a function and my grandmother and I are having dinner at our home. I watch her hand shake as she stirs a bowl of oats, the lattice of veins on it standing out, bearing witness to the 91 years of her life. Then, the plates are cleared and the tube light is switched off. 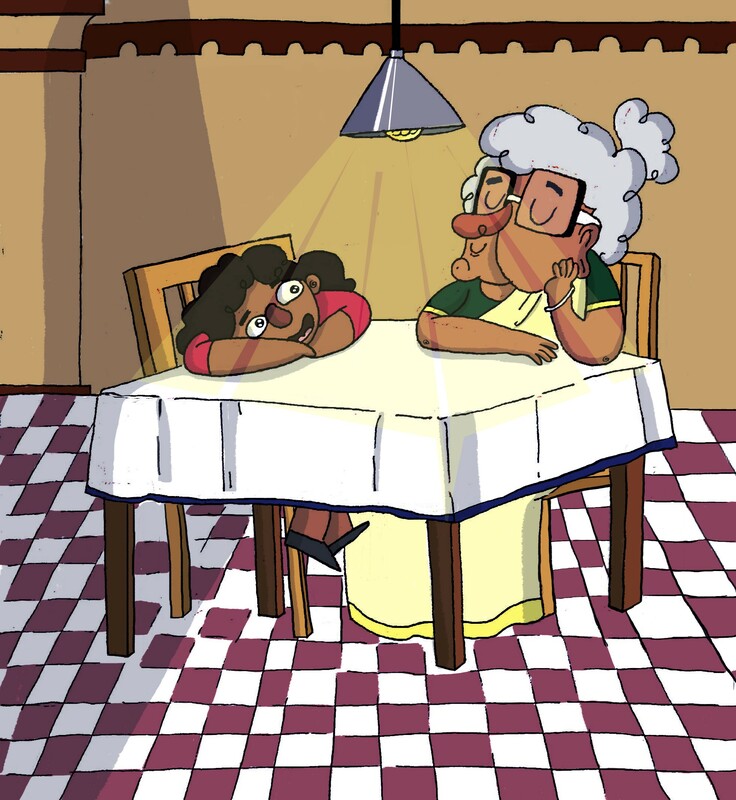 In the dim glow of the overhead lamp, my grandmother transports me to a different time — her time — when she was a gawky young girl with stick legs and pigtails, eager to bring forth the stories rattling within her. “What is that?” I ask her. “Then what did your meals consist of?” I ask her. “When my father, who was a lawyer, moved to Thrissur, we lived in a large 25-acre compound. In it, there were five small tenements where many daily wage workers lived with their families. My step-mother would make kanji (rice gruel) for the workers and my sister and I, too, would have that for breakfast. For lunch, the water would be filtered from the kanji and it would become rice. This would be served with side dishes like boiled achinga (long beans) or koorkka (a kind of tuber). This was the meal for everyone from esteemed guests to daily wage workers. As my grandmother’s voice peters off, I notice the cacophony of crickets filling the night air. She is lost in reverie and I’m left with a curious sense of loss, a nostalgia for a childhood I’ve never lived. I realise that it is not just traditions that we are losing; it is a way of life that is disappearing with each generation of Syrian Christians. In my mother’s ancestral home in Kottayam, for example, there was a large wooden granary made of jack tree wood used to store rice for the year. It was located near the kitchen and, as children, we used to hide in its nook and corners during games of hide-and-seek. After my grandmother’s death, the room was converted into a storeroom; the dark corners lie languid and lonely. The Syrian Christians of Kerala are one of the oldest Christian communities in the world. St Thomas, the Apostle, is believed to have arrived at the seaport of Muziris in Kerala in AD 52. He converted many people, including several Namboodiri Brahmin families, to Christianity. Most of these early Christians were known as Malabar Christians until the advent of a Syrian merchant called Thomas of Canaan who arrived in Muziris. The Syrians he brought with him and the Malabar Christians intermarried, leading to the birth of the Syrian Christian community in Kerala. The cooking traditions of the Syrian Christians have evolved over centuries of trial and error and have incorporated Arab, Chinese, Malay, Portuguese and Syrian influences. Some of the traditional Syrian Christian dishes include erachi olarthiathu (fried beef), meen vevichathu (fish curry cooked in a clay pot), ethakka appam (plantain fritters) and kozhukotta (stuffed rice cakes). These dishes would be cooked in a traditional Syrian Christian kitchen found in ancestral homes like the one in which my mother grew up. Lathika George, in her book The Suriani Kitchen, describes this kitchen. It centred around the hearth which had four to six stoves. The heat of each stove was controlled by the amount of wood placed in the fire. There would be a little stone and mortar pestle in which small amounts of spices or chillies were crushed or powdered. The kitchen countertop held the grinding stone on which most of the daily spices were ground or crushed. A deep stone sink could be found in a smaller room nearby and here the large pots and pans were scrubbed after cooking. The storeroom, usually adjacent to the kitchen, was where large reserves of food staples were kept. Larger homes had separate rooms for storing coconuts and dry wood. The biggest casualty of our modern day, I feel, is not the loss of traditions but the loss of time. I never seem to have the time for anything, least of all to cook elaborate meals. I have cereal for breakfast, lunch from my office canteen and get fast food delivered to my apartment for dinner. With the globalisation of cuisine, we appropriate dishes which are from other parts of the world as our own. If you know what Nasi Lemak is, you are worthy of being emulated. If you know how to cook it, you are worthy of being adulated. 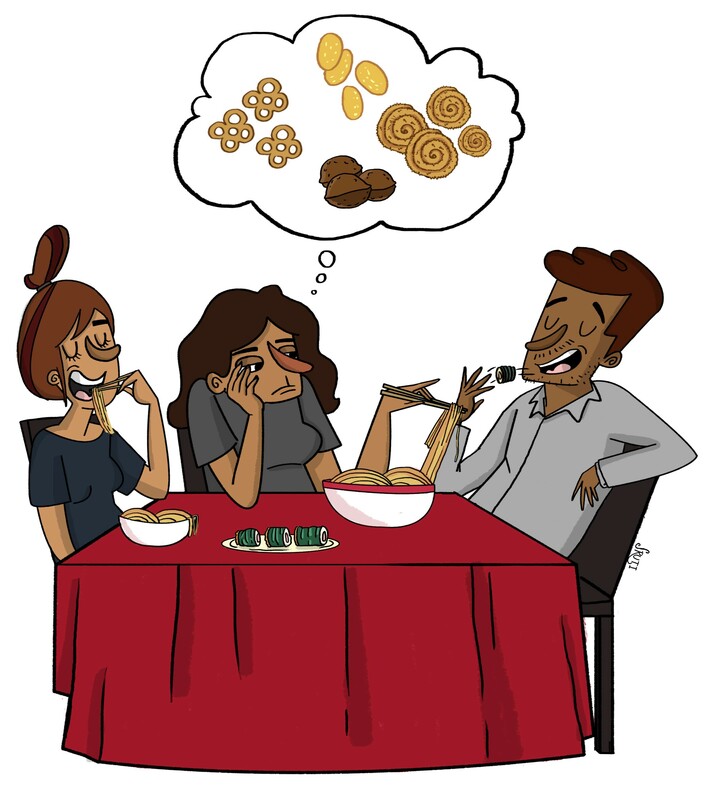 But breaking an achappam (Kerala style rosette cookie) into five rings and sucking them out of my fingers with messy abandon will always give me more pleasure than learning how to consume a dish of Nasi Lemak with suave finesse. Anjuly Mathai is a senior correspondent at The Week magazine. She is an aspiring fiction writer, compulsive dreamer, and travel junkie. Connect with her here.